Based on a clinical trial NCT00289640, 10 mg/kg was the optimal dose. According to Dr. Wolchok and investigating the dose of Anti-CTLA-4 blockage recently, the higher the dose the better the immune response. The best overall response rate was 11•1% (95% CI 4•9—20•7) for 10 mg/kg, 4•2% (0•9—11•7) for 3 mg/kg, and 0% (0•0—4•9) for 0•3 mg/kg (p=0•0015; trend test). Is this the Medical Scam of the Century? Where are the ethics? Intravenous Solution, Intravenous, Ipilimumab 3 mg/kg, Ipilimumab - one dose every 3 wks for a total of 4 doses. Subjects who are eligible may receive another 4 doses given every 3 wks; Until disease progression, unacceptable toxicity or withdrawal of consent"
This trial is set up for failure and it is a well known fact that with this drug there is some progression before regression. 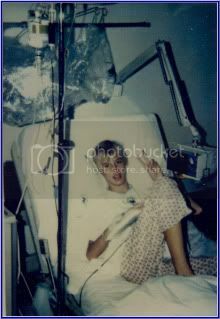 I believe Bristol Myer Squibb is doing a disservice to the Cancer Community especially the Melanoma Patients. Déjà vu.. Blame it on the Tregs!!!!!! I postulate that the T regulatory cells may be the major stumbling block in the whole immunotherapy. compared with both tumor-free lymph nodes and that advanced melanoma is associated with increased numbers of circulating Treg cells and Dendritic Cells (DCs) and suggested that melanoma induces immunosuppressive DCs and Treg cells in the systemic circulation of the patients . Vence et al also showed the presence of tumor antigen-specific CD4＋ Treg cells in the blood of patients with metastatic melanoma. 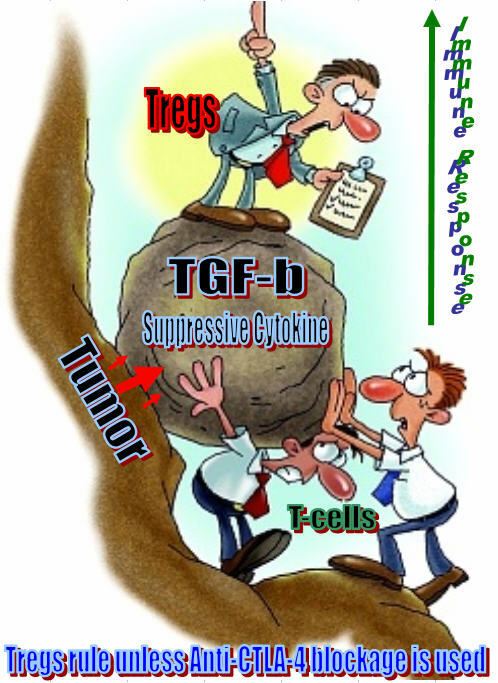 This means the host (you) may already have the correct antigen, but the tumor and microenvironment may be suppressing the immune response by secreting suppressive cytokines like TGF- beta , IL-10, and IL -6 and or proliferating the suppressive Tregs. Nicholaou et al most recently showed in patients with melanoma that although strong antibody responses were mounted, the generation of delayed-type hypersensitivity response was significantly impaired and patients with advanced melanoma had a significantly higher proportion of circulating CD4＋ CD25＋FoxP3＋ Treg cells compared with those with minimal residual disease. 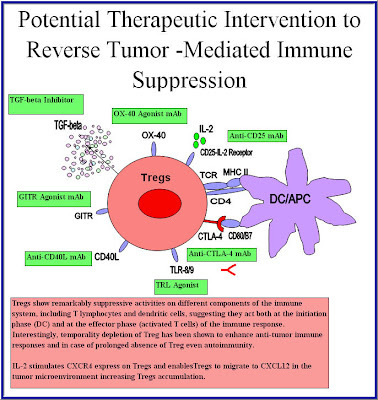 So we now can blame the tolerance of our immune system to cancer on the T Regulatory Cells (Tregs). It has been reported that the large number of different cell types that are claiming to be directly targeted by FoxP3＋ Treg cells are CD4＋, CD8＋ T cell, dendritic cells, B cells, marophages, osteoblasts, mast cells, NK cells, and NKT cells. No wonder our immune system can’t raise an attack on the Melanoma. The tumor is like a castle in the middle ages. 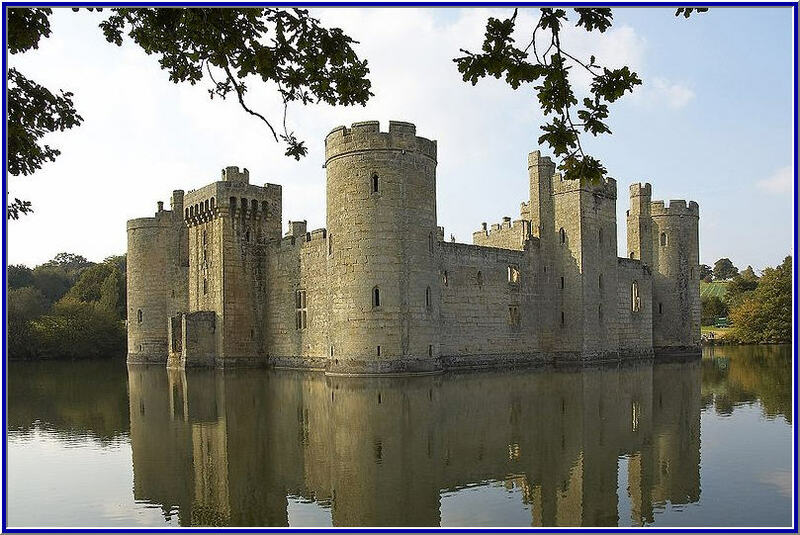 The castle (tumor) is surrounded by a moat the (suppressive cytokines) and the walls and towers are the Tregs. If you take out walls and tower, the castle becomes vulnerable. It was also noted as the tumor burden increased, so did the Tregs in the peripheral which makes it harder to eradicate tumors in the advanced stage of Melanoma. Wieczorek et al found that Treg cell numbers are significantly increased in the peripheral blood of patients with IL-2-treated melanoma. IL-2 stimulates CXCR4 expressed on the Tregs enables the Tregs to migrate CxCL12 in the tumor microenvironment increasing the Treg accumulation. So we need to deplete, block and limit the expansion of the Tregs. We also want to limit the concentration of Interluekin-2 at the early stage of the CD4+ T-cell expansion. This can be done in a number of ways, but why not use an antibodies that can indirectly accomplish both tasks at once. 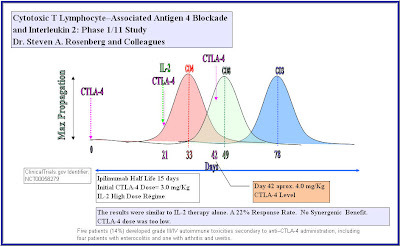 By using anti-CTLA-4 blockage we keep the activation going, causing a free for all for the cytokine IL-2 that is secreted. 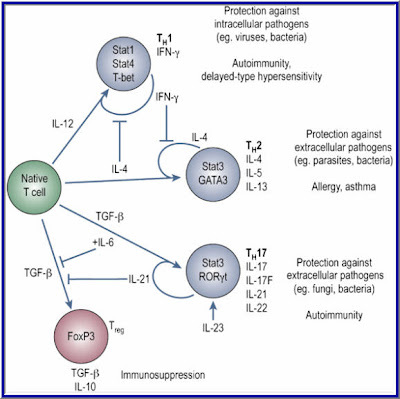 CD4+ T cells regulate immune responses by producing various cytokines upon antigen stimulation. Naive CD4+ T cells have limited cytokine responses and secrete only IL-2 before they differentiate into various effector cell types CD4+ T cells regulate immune responses by producing various cytokines upon antigen stimulation. Each cell type is competing for a limited amount of IL-2 secreted by a small subset of the T helper cells. Naive T cells stimulated with antigen in the presence of IL-4 differentiate into Th2 cells secreting IL-4, IL-5, IL-10, and IL-13, whereas IL-12 induces the differentiation of naive cells into Th1 cells secreting IL-2, IFN-γ, and lymphotoxin. Ribas and Restifo et al found that if you use Anti-CTLA-4 blockade the native T-cell is pushed towards the Th17 differentiation. This causes less interleukin-2 to be produced by the CD4+ T-cells causing a shortage of IL-2 in the microenvironment for the expanding T-cells thus limiting the differentiation to Tregs. It is well known that in the presence of TGF-beta and IL-2, the Native T-cell differentiates into T Regulatory Cells. critical IL-2 signal from CD4+ cells is mediated through the IL-2R (receptor) of Naïve CD8+ cells. This activation of IL-2 signaling advances the restriction point of the cell cycle, and thereby expedites the entry of antigen-stimulated Naïve CD8+ T-cell into the S phase of the cell cycle. 1. G1 phase when the cell increases in size and gets ready to replicate its DNA. 4. M phase when mitosis occurs. If no IL-2 is available to Naïve CD8+ T-cells, they never get a chance to expand and differentiate into Cytotoxic T Lymphocytes (CTLs) Killer T-cells. Besides promoting cell proliferation, IL-2 stimulation increases the amount of IFNγ and granzyme B produced by CD8+ T cells. Naïve CD8+ T-cells are referred to as CTL-precursors (CTL-Ps), which are incapable of performing any function other then recognizing the class I MHC-antigen complex on the Tumor cells through the (TCR) T Cell Receptor. The Cytokine IL-2 came from the(CD4+) TH1 cells which means the CTL-P is IL-2 limited and can only be activated by the secreted IL-2 if there is any to be had or by introducing IL-2 through IL-2 therapy. Now you know the reasoning behind using the IL-2 therapy as the second part of the combinatorial Therapy. If there is not enough IL-2 in the host environment, you will only get partial expansion of the CTLs. It may not be enough to eradicate large bulky tumors. Research suggests that the primary mode of the destruction of the tumors by CTL is by initiating death through the Fas-FasL pathway. Studies have shown that CTLs store Cytotoxic proteins in the form of granules in their cytoplasm. 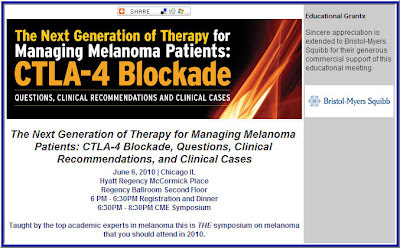 So now you know why Anti-CTLA-4 blockage and HD Interluekin-2 go hand and hand. Timing of the addition of IL-2 can make or break the immune response. 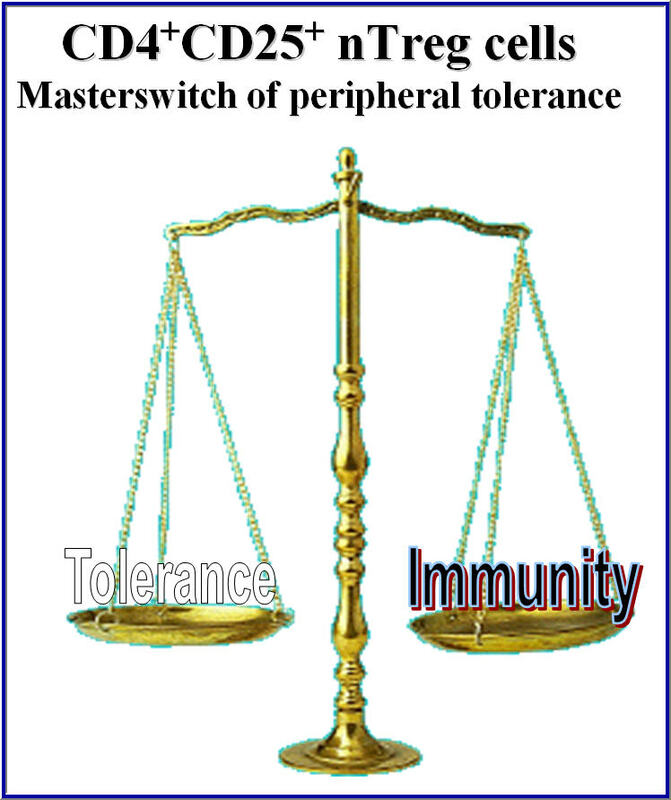 And without suppressing the Tregs, your chances to mount an immune response may be slim at best. Your Immune System is a well Orchestrated system of events; we just need the Knowledge on how to harvest its potential on eradicating cancer. Dr. Rosenberg, during my search for answers about my therapy, I took notice of a combinatorial trial that you headed in 2003. 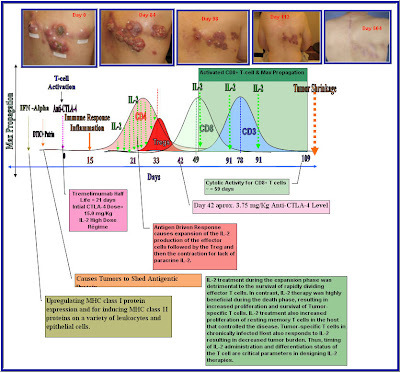 • Determine the maximum tolerated dose (MTD) of anti-cytotoxic T-lymphocyte-associated antigen-4 monoclonal antibody (MDX-CTLA4) in combination with high-dose interleukin-2 (IL-2) in patients with metastatic melanoma. (Phase I is closed to accrual as of 4/13/2004). • Determine the activity of MDX-CTLA4 administered at the MTD with high-dose IL-2 in these patients. 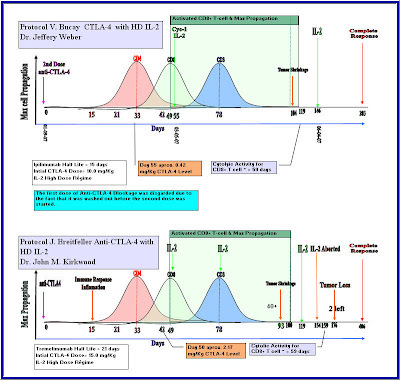 • Determine whether the administration of IL-2 alters the pharmacokinetics of MDX-CTLA4 in these patients. • Determine the safety and adverse event profile of this regimen in these patients. OUTLINE: This is an open-label, dose-escalation study of anti-cytotoxic T-lymphocyte-associated antigen-4 monoclonal antibody (MDX-CTLA4). 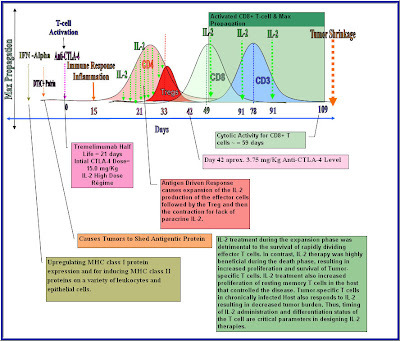 • Phase I: Patients receive MDX-CTLA4 IV on days 0, 21, and 42. 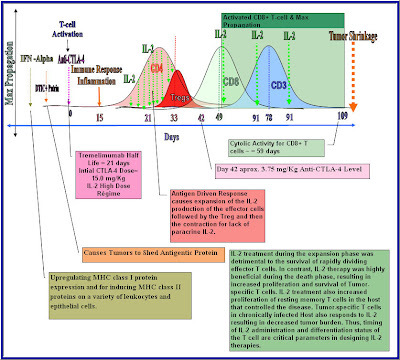 Patients also receive high-dose interleukin-2 (IL-2) IV over 15 minutes every 8 hours for up to 15 doses beginning on days 22 and 43. Treatment repeats every 63 days for up to 3 courses in the absence of disease progression or unacceptable toxicity. Patients with an ongoing partial response and no greater than grade 1 toxicity may receive additional courses of therapy. Patients who require discontinuation of MDX-CTLA4 due to toxicity may continue receiving IL-2 at the discretion of the investigator. Cohorts of 3-6 patients receive escalating doses of MDX-CTLA4 until the maximum tolerated dose (MTD) is determined. The MTD is defined as the dose preceding that at which 2 of 3 or 2 of 6 patients experience dose-limiting toxicity. (Phase I is closed to accrual as of 4/13/2004). 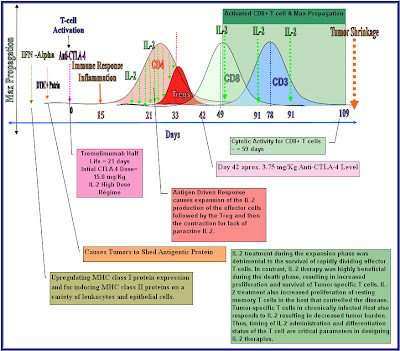 • Phase II: Patients receive treatment as in phase I at the MTD of MDX-CTLA4. Patients who achieve a partial or complete response and later develop recurrent or progressive disease may be retreated at the same dose. Patients are followed at 3 weeks, every 3 months for 1 year, every 6 months for 2 years, and then annually thereafter. PROJECTED ACCRUAL: A total of 3-51 patients (3-18 for phase I and 19-33 for phase II) will be accrued for this study within 1 year. (Phase I is closed to accrual as of 4/13/2004). Based on knowledge gained over the last decade, I believe it warrants us/you to revisit this combinatorial approach. 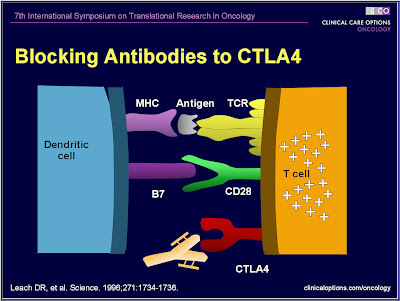 Base on Dr. Wolchok’s research, the dose of the anti-CTLA-4 was to low to shift from tolerance to activation. Also, the addition of the HD IL-2 was added at the time to proliferate the CD4+ T-cells which may have caused a five fold expansion of the Tregs. There is now new data that suggests that IL-2 addition should be added after the contraction of the CD4+ T-cells. Et al Wherry. By adding the The HD IL-2 after the expansion of the T-cells, IL-2 therapy was highly beneficial during the death phase, resulting in increased proliferation and survival of tumor-specific T cells. IL-2 treatment also increased proliferation of resting memory T cells. If you add the combination of IL-2 and TGF- beta (tumor secreted) at the beginning of the treatment, it induces naive or total CD4+CD25– cells to develop strong suppressive effects both in vitro and in vivo according to Horwitz et al 2001. The T-Cell differentiation is pushed towards developing Treg suppressive immune cells. So increasing the dose of Anti-CTLA-4 Blockade and delaying the addition of the HD IL-2 can have a dramatic effect on the overall response of the immune system. 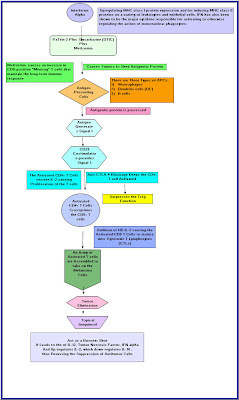 Here is a graphic representation of the protocol. I know you will get a synergistic response with this protocol because it happen to Dr. Vivian Bucay and myself. therapy of Anti-CTLA-4 Blockade and HD IL-2. Using personalized vaccines, researchers enlist the immune system to oust tumors. In 2003, Stephen Creel, a manager at a software company in Austin, Texas, suddenly started passing blood in his urine. He had just celebrated his 40th birthday with friends and his wife, who was pregnant with their daughter, and he was as fit as he’d been in years. The diagnosis of kidney cancer—renal cell carcinoma—was “shocking,” Creel says. His father-in-law, a cancer researcher, directed Creel to M.D. Anderson Cancer Center in Houston, almost 170 miles away, where oncologists were testing an experimental vaccine to treat kidney cancer. They surgically removed patients’ tumors, sent samples away for processing, and then re-injected cancer-specific proteins back into the patient. They were trying to activate the patients’ own immune system cells, train them to recognize cancer as an invader, and fight it off. What if you could get your body to immunize yourself against Melanoma? You would just need your immune system to recognize the tumor antigen. It can and has been done. I am one of those cases. Take a look at my jounery in the papers below. For all you out there, Life is so fragile. "Live like there is no tomorrow, because you never know what tomorrow will bring." Won't you fly high, free bird, yeah? Patti will be dearly missed. BUSHNELL, Fla. -- Authorities have identified the names of the four motorcyclists killed following a collision on a central Florida road. The Florida Highway Patrol says the victims were killed Saturday night in Bushnell after leaving a gathering with friends when their bikes were struck head-on by a truck trying to pass another vehicle. Killed were 54-year-old William Barker; his passenger, 55-year-old Patrice Poole; 55-year-old John Holmes; and his passenger, 52-year-old Patricia Beihayn (Patti Breitfeller). Authorities say 45-year-old Paul Sermons didn't realize how close two motorcycles in the other lane were and wasn't able to slow down before the collision. The drivers and passengers of the motorcycles were all ejected in the crash. Sermons received minor injuries in the crash. "He made this his cause after his wife, diagnosed with advanced breast cancer a decade ago, had to fly from their home in Wisconsin once a month to be treated at NCI. She participated in a clinical trial there, surviving months longer than expected. When your husband is one of the nation's top oncologists, you know where to go. As for the other 1,490,000 people who are diagnosed with cancer this year, good luck." So for Melanoma Here is the short list. I want to thank you for responding to my emails over the last few months. I know I can be candid and straight to the point sometimes. 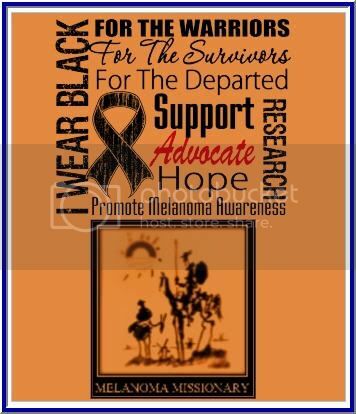 By reopening the compassionate Drug Use (ipilimumab) you and your company gave the Melanoma Patients “The Last Chance of HOPE”. You don’t know how much this means to us. If we haven’t passed the “Lethal Tumor Burden” we still have a chance of survival. I believe you have done your company justice and showed your compassion. My faith in the Company’s Ethics have been restored. Now we need to prove to the world that this drug may be one of the most important discoveries in the last twenty years of Cancer. By taking the “Brakes off the Immune System” we can harness our own immune system to battle cancer. Granted we may have to use the drug in combinatorial therapy to rid the host of the cancer once and for all. I hope you and your company can collaborate together with all the major players in this exciting field of Oncology. See it took millions of years for our immune system to evolve, so why do we think that one drug can do it all. We need to approach the Beast arm to arm, to block all the pathways so it can’t escape. This can only be done by using one’s own immune system. revolutionary therapy/protocol. Please if you get a chance, listen to some of the lectures and symposiums from the like of Dr. James Allison, Dr. Jedd Wolchok, Dr. Antonio Ribas, Dr. Jeffery Weber,Dr. Keith Flaherty and others. You will be amazed at their accomplishments in the clinical setting. But they need more. They need access to the entire drug arsenal that is available across companies. We now know that timing and dose concentration plays a major roll in setting up an immune response. There are feedback loops. It is like dominos. You have this elaborate step-up. It may take weeks to build. Once you set it in motion, the chips begin to fall. There are different pathways, cytokines, T-cells, receptors, etc that need to be taken into account get the right immune response. This immune response can only be generated if you have all the keys to unlock the response. We need yours and other Pharmaceuticals to work together for the good of the cancer patients. We need to take down all the red tape which also includes the FDA. We are very interested in combination trials. 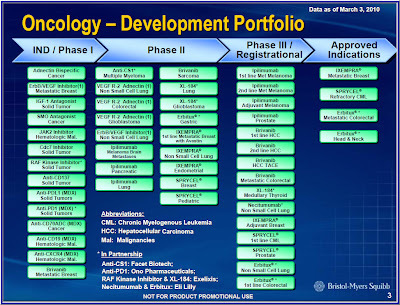 One is ongoing with a PD-1 antibody and many more are planned especially with a variety of targeted therapies. I can assure you we have prioritized the ipilimumab program as high as any in the company. Our compassionate use program will reopen hopefully in late March. Thank you for your continued interest. Your ideas have been widely circulated. 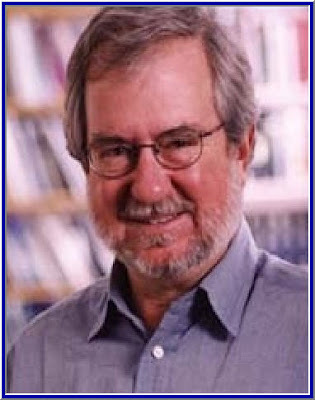 In the midst of many promising discoveries, it became apparent to Dr. Allison and other researchers working in the field that stimulation of T cell response was more complicated than originally thought. As Dr. Allison and others discovered, first the T cell uses a structure called the antigen receptor to recognize a foreign antigen in the system (created by infecting viruses or bacteria, or new antigens found in tumor cells). Using an automobile as an analogy, Dr. Allison likens this step to turning the key in the car's ignition. "The car is running, but it's not going anywhere." Recognition is not enough. Dr. Allison explains: "A second signal is also required, which, in the car analogy, would be the foot on the gas pedal." This second signal occurs when a particular family of molecules called the B7 molecule engages a molecule known as CD28 found on the surface of the T cell. Only these molecules are capable of initiating T cell response. It is now well accepted that recognition of specific antigen by the TCR is not sufficient for activation but that a second antigen nonspecific "co-stimulatory" signal is required. We have demonstrated that this second signal is provided the co-stimulatory receptor CD28 upon recognition of its counter-receptors, members of the B7 family, on the antigen-presenting cell. CD28 engagement is required under most situations for IL-2 production and proliferation. The lack of a CD28-mediated co-stimulatory signal upon TCR engagement can result in the induction of a long-lived state of nonresponsiveness. We have recently found that co-stimulation is more complex than previously thought. CTLA-4, a homolog of CD28, also binds members of the B7 family, and binds them with affinities much higher than CD28. A wealth of data accumulated in the past few years show that CTLA-4 is an important downregulator of T cell responses. We have proposed that CTLA-4 plays a critical role in both the initiation and termination of T cell responses. According to this view, T cell activation is a dynamic process that is determined by the strength of the TCR signal; the strength of co-stimulation provided by CD28; and the magnitude of inhibitory signals generated by CTLA-4. "I believe that we are on the verge of bringing the manipulation of immune responses into the mainstream of cancer therapy," Dr. Allison said. "Recent work in cancer biology has shown that the genetic instability that is inherent in cancer results in a large number of mutations in proteins that create new antigens that the body has never seen before and ought to be readily recognized as foreign by the immune system. If we can kill some tumor cells, either as a result of a vaccine or treatment with more-conventional therapies, using agents such as anti-CTLA-4 ought to result in induction of potent immunity to these new targets. Thus, I believe that it is not unreasonable to think of many of the new targeted therapies as immunosupportive, and to use them in conjunction with the new approaches to enhancing immune responses." We are on the Verge of Harnessing the Immune System to recognize Melanoma cells as foreign. How this plays out will depend on if the Pharmaceutical companies like Bristol-Myer Squibb, Novartis, Pfizer, Hoffman La Roche, Plexikkon and other come together as one, to fight this Monster of a disease. Time will only tell. We owe it to the Patients. "A dynamic picture is emerging in which the immune system is far from quiescent in cancer, and tumor cells elaborate a host of countermeasures to evade immune destruction. In essence, these are two systems which co-evolve over time. 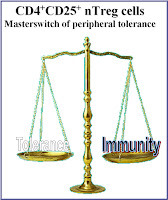 Clinical outcome is ultimately a balance between the proliferation of tumor cells and the immune response which attempts to control these cells. 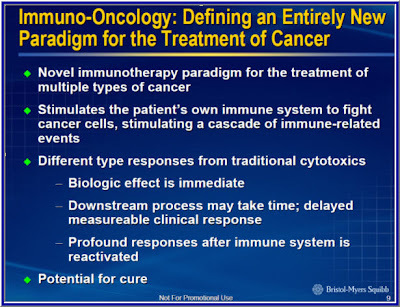 Various treatments may perturb these two systems in different ways - in good clinical outcomes, the immune response ultimately dominates, while in poor outcomes, tumor cells dominate. It is becoming clear that the challenge in tumor immunotherapy lies not only in lack of tumor recognition, but also ineffectivity of the immune response that develops. While efforts to elicit tumor-specific T cells directly in patients via vaccination may overcome potential mechanisms of immune evasion by tumors cells, current immunotherapeutic strategies do not address their potential immunomodulatory mechanisms. 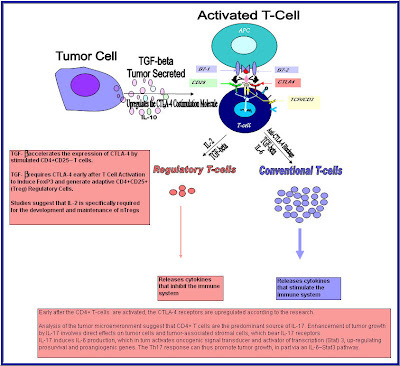 Understanding the molecular mechanisms which underlie T cell dysfunction in cancer will be important to devise novel adjunct strategies to enhance or modulate T cell responses after tumor-specific T cells have been elicited. It will likely take a multi-faceted approach acting at several steps along the T cell activation and effector activity pathway to finally achieve success in cancer immunotherapy." This multi-faceted approach acting at several steps along the T cell activation and effector activity pathway is what I call Combinatorial Therapy. We first start at obtaining the Antigen to be presented on the Antigen Presenting Cell. Then once we think we got it, we need to proceed to the Activation step. Ipilimumab (Anti-CTLA-4 Blockade) helps to keep the activation in the on position. It also has a dual role, in keep the Treg's surpressive function out of play in the Tumor 's microenvirioment. Interleukin -2 is the final step to complete response. It is the growth factor for the CTL's, which help maintain functionality and survival of the Cytotoxic T Lymphocytes (CTL's). 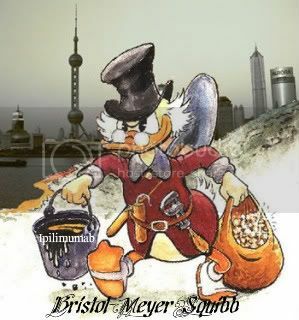 Pictures are from Bristol-Myer Squibb. "If the timeline Fits, You must build it"
A Clinical Trial with this Protcol Design. Bristol-Myer Squibb says it will seek FDA approval for ipilimumab as a second-line treatment in advanced melanoma in 2010. "Phase 3 top-line results are due from a study of ipilimumab in patients with previously untreated metastatic melanoma taking a combination of ipilimumab plus the chemotherapy dacarbazine or dacarbazine plus placebo. Concurrent with a business update to analysts and investors on Mar. 4, BMS says it will seek U.S. regulatory approval for ipilimumab as a second-line treatment in advanced melanoma in 2010, and will move the drug into Phase 3 trials in non-small cell lung cancer based on Phase 2 study data, which it would present at a major medical meeting later in 2010. The company did not provide any additional details on the data." Bristol-Myer Squibb's Ipilimumab Can't Cure Cancer alone, It will need to be done with Combinatorial Therapy. Dr. James Allison of the Ludwig Center for Cancer Immunotherapy at Memorial Sloan-Kettering Cancer Center in New York, New York, described his laboratory’s latest research into the mechanisms of immune checkpoint blockade in the treatment of cancer, and showed data from mouse and human studies that support the further investigation of immune checkpoint blockade therapy alone and in combination with other anti-cancer therapies. signatures that may predict the response to forms of immunotherapy. The identification of such gene signatures has had important implications in the development of targeted immunotherapies for patients with metastatic disease. Thus, we must focus our efforts towards an improved understanding of the molecular and immunologic events involved in melanoma development and progression. We should also re-evaluate our present approach to immunotherapy and trial design, with many past trials failing to show clinical efficacy because of a lack of appropriate preclinical data that provide the essential rationale to perform such studies.